The mild January may have lulled you into complacency when you saw your gas bill was almost $100 lower than the one for December. Monsieur Winter, however, returned from vacation in February, and, finding you lolling around the apartment in a t-shirt and jeans, saucily slapped you back to reality with a frosty glove to the face, leaving you with a deep, malingering chill to remind you, once more, why a Michigan degree was a bad idea. You've turned the heat down 5 degrees lower than you kept it last winter. You're already wearing a turtleneck and a sweatshirt to try to keep warm. If the girl next door comes over to borrow a cup of sugar and sees you've put a hoodie on over that, your chances are as good as gone. What to do when overnight temperatures drop to the single digits? Put up a thermal block. From our friends, the architects, I have stolen a simple, clever, non-pretentious idea that will soothe the stinging slap from that punkass season. Basically, it involves hanging a sheet over the doorway(s) of a central room. In my case, the front door doesn't seal tight and cold air whistles in despite a storm door and weather stripping. 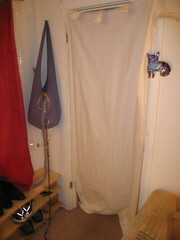 The solution was to hang a curtain across the doorway from the entry area to the living room. Having blocked the cold air from immediately mixing with the warm living room air, the room stays warmer and the furnace isn't blasting away. The cold air coming indoors lingers at the door instead of wafting up the stairs to the second floor or rolling into the living room. 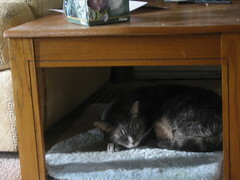 Everyone's happy and toasty -- especially the cat with her mat by the heat register. Give this option a serious thought if you're bundled up but still cold during the cold snap.